Maintenance releases are now available for SecureCRT 8.3.1, SecureFX 8.3.1, and ClientPack 8.3.1. Download the 8.3.1 official releases today. As always, you can evaluate these new releases without charge for 30 days. The 8.3 releases provide time-saving features that improve the look, feel, and performance of the UI and make it faster and easier to connect to and manage sessions. SecureCRT introduces new built-in ANSI color schemes, including Solarized, so that you can easily change the look of your terminal workspace. In both SecureCRT and SecureFX, the Connect bar autocomplete begins filtering as soon as you start to type so that you can quickly find and connect to sessions. Pre-defined color schemes, including Solarized, make it easy to change the look of your terminal workspace. Choose from a variety of light and dark color combinations with coordinated background, foreground, and ANSI colors. New built-in ANSI color schemes, including Solarized, make it easy to change the look of your terminal workspace. Choose from a variety of light and dark color combinations, all of which have coordinated background, foreground, and ANSI color combinations. 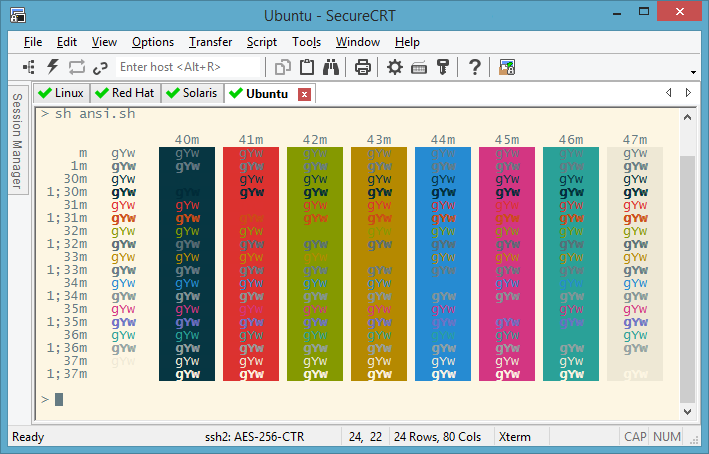 When the SecureCRT window is resized, the text in the terminal area is rewrapped. Connect bar auto complete begins filtering as you type, making it easier to find and connect to saved sessions. A paste confirmation dialog option allows you to preview the contents of the paste buffer before pasting multiple lines of text into a session. This helps prevent accidental pasting of buffer contents into a production or other critical server. Multiple sessions can be dragged and dropped or copied and pasted in the Session Manager and Connect dialog. Filtered searches in the Session Manager and Connect bar are faster, which is helpful when the session database is large or located on a network drive. Up to 16 sessions can now be included on the recent session list. Support has been added for the SSH2 ChaCha20/Poly1305 and AES-GCM ciphers and the UMAC-128 MAC algorithm. OpenSSH certificates can now be used for authenticating SSH2 sessions. Scripting enhancements include the ability to script session locking from the Session object. If a session cannot be cloned or connected using SFTP on the existing SSH transport, SecureCRT will create a new transport. The “Update Now” menu item is now also available for the Mac, which checks for a newer version of SecureCRT. New to the Mac and now on all platforms, arguments can be passed to a local application that is launched when a tunnel is established. Auto complete in the Connect bar begins filtering as you type, making it easier to find and connect to saved sessions. Support has been added for the SSH2 ChaCha20/Poly1305 and AES-GCM ciphers and the UMAC-128 MAC algorithm. OpenSSH certificates can now be used for authenticating SFTP sessions. Synchronization is now faster when working with large numbers of files and folders. The “Update Now” menu item is now also available for the Mac. Check for a newer version of SecureFX, and if available, click on a button to download and install the new version. It is now easier to script file transfers using SFXCL with the ability to take actions based on exit codes that indicate why the operation failed. vsh/vcp/vsftp: Support has been added for the ChaCha20/Poly1305 and AES-GCM ciphers and the UMAC-128 MAC algorithm. vsh/vcp/vsftp: Support has been added for public-key authentication with OpenSSH certificates. VRALib (Windows): Support has been added for UMAC-128 MAC algorithm. vcp/vsh/vsftp: SHA-2 fingerprints are now also shown in base64 in addition to hexadecimal. vkeygen: The SHA-2 fingerprint is also shown in base64 when keys are created or displayed using the -l and -f flags. You can download any of the 8.3.1 official releases from the download page.